President Yoweri Museveni has said he is firmly behind Minister Kiwanda’s support of an initiative by a group of young people led by Ann Mungooma promoting ‘Miss Curvy’ campaign which has stirred controversies among women activists and on social Media. Museveni said while promoting Ms Curvy is not a cabinet decision as insinuated in media reports, his suspicion is that after Uganda embracing and appreciating Ms Quiin Abenakyo who won the Miss World Africa Contest in China and was later hosted by the President and by the Parliament of Uganda, the young people in their thinking must have said if beauty is a selling point for a country and the world, lets be creative. “I suspect these young people where being creative. One of these young people Ann Mungooma is a sharp shooter. His father was an officer in the army who represented Uganda in shooting, she is good. We should talk to them quietly. I suspect when Miss World won the beauty contest, in their simple reasoning they started this and talked to [Minister] Kiwanda. We shall advise them and understand where they are coming from. They may have thought if beauty is good, how about structure,” he said. The President cautioned that instead of so called activists who are full of themselves criticizing these young people, they should talk to them and handle them with sympathy. “What is the boundary between beauty? If you can compete for beauty (Nalulungi), how about structure (Nabitege). I can’t explain to my young people that Nalulungi is more beautiful than Nabitege. How do you say who is right? This whole idea started with appearance. If you appreciate one, why not the other? We should discuss if appearance is an issue. Maybe we made a mistake by appreciating Nalulungi. I was wondering…could I allow my grandchildren to participate..Noo! I had my private views by did not want to raise them when I hosted Abenakyo. I only commented on her wig. The question is should our children be involved in exploitative appearances,” he said. The President said the whole country encouraged Miss World Africa Abenakyo to sell Uganda. “If we did that, were we right, only slim ones? Of course people should not come to look at our women. When we had AIDS, I came and shouted, ‘avoid skirts and trousers’, people said am discouraging tourism. I told them if the tourists come, they should stick to their terms of reference,” he said. Museveni also said he behind Makerere University administration’s efforts to restore discipline to one of Uganda’s Highest and greatest institution of learning. “Nawangwe is an Engineer, a professor of Technology and wants to restore discipline to this institution. People want to continue with buyayesism. Imagine a professor who stripes naked and is cheered on. Makerere is a centre of study not stupidity. I am firmly behind him,” the President said. 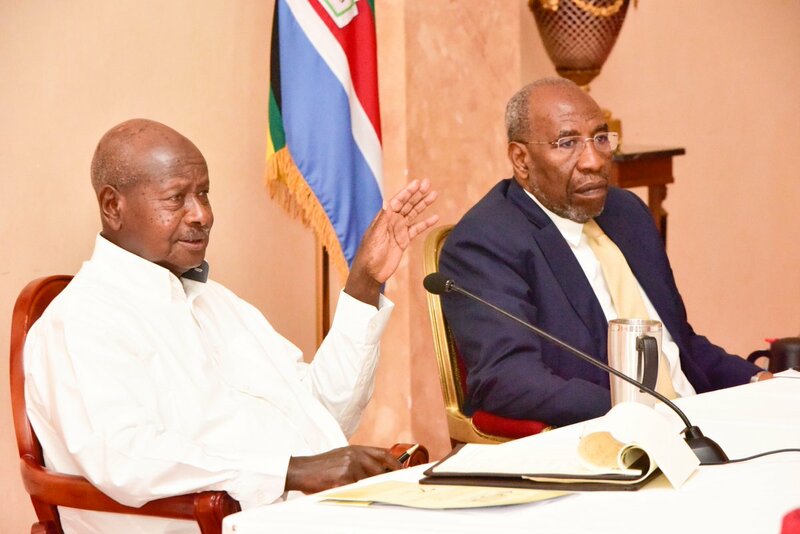 The President was responding to questions about the conflict between Makerere administration and academic staff from journalists who ‘ambushed’ him shortly after he launched the six phase of the Presidential Investors Roundtable at State House, Entebbe on Thursday evening. The conflict between the University administration and its academic staff follows the suspension of various lecturers for misconduct, indiscipline and involvement in acts that breach the terms and conditions of their employment.